These stately creatures are extremely intelligent, graceful and majestic. For eons they have travelled the seas singing their whale songs and danced to the beat of the waves. Mothers form close relationships with their young, who start suckling from birth until about one year of age. As mammals, they are born with a fine sprinkling of hair which through the years mostly disappear. Whaling started in Norway, some 5000 years ago, with the Southern Right Whales making easy targets by ruthless hunters. 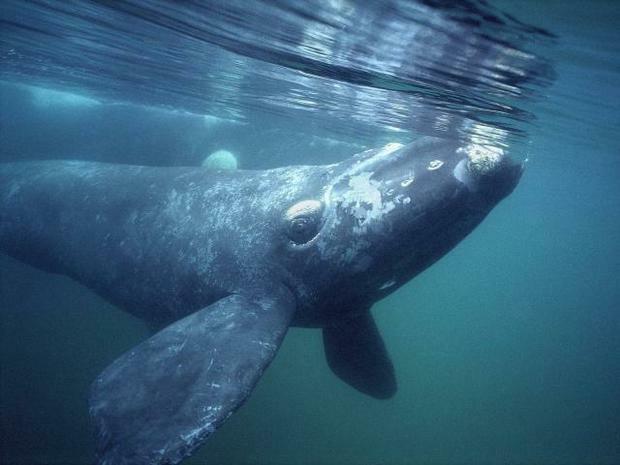 These beautiful animals are slow swimmers and float when killed, thus making them the “Right Whale” to hunt. Even though commercial whaling has been banned for more than 20 years, people continue to fire harpoons into these gentle creatures, causing many species to be endangered. The Southern Right Whale is conservation dependent with about 3000 in the sea to date. Whales, like dolphins communicate by means of sonar. They make clicking, grunting and whistling sounds which also act as a means of echolocation. These can be heard for miles under water, and can also be heard from above water. Whales are also thought to communicate by slamming their tails against the surface of the ocean which produces a loud splashing sound, an action called lobtailing. When whales breach, they are also thought to be communicating with other whales. When a calf is born, it is between 5 and 6 meters long. By adulthood (approximately 10 years) the males are on average 15.2 m and the females 16.5 m.
The southern right whale has a circumpolar distribution and inhabits sub antarctic water between about 30° and 55° south. The whales migrate south during the summer months when supplies of krill are more prolific, and north during winter and spring to mate, calve and rear their young. They appear around the South African coastline from May to December. They can be seen interacting in the sheltered bays and coves close inshore and near river mouths. The lifespan of the Southern Right whale is estimated to be 90 - 100 years. The gestation period is about 12 months and the calf is born tail first. The newborn is helped to the surface of the ocean by its mother to take its first breath, and after thirty minutes has learned to swim. The calf and mother spend the first year together, with the baby living off its mother’s milk. 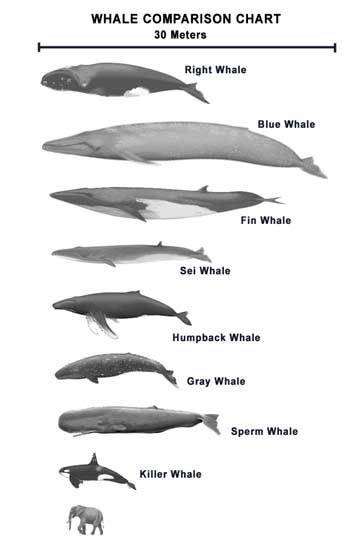 Whales breed in warmer waters and females usually have one calf every 1-3 years. The Southern Right Whales are filter feeders and get their food through the water which is filtered through the baleen in their mouths. Plankton and other tiny crustaceans are constantly being ingested. On occasion they are also bottom feeders, eating benthic prey from the mud on the ocean floor. Baleen: A series of stiff, flexible material that hang from the upper jaw. The inside of the baleen is edged with hairy plates that filter krill. Baleen is made of keratin (the same substance our fingernails are made of) and can be up to 3 meters in length. It is also called whalebone. Unlike fish, whales swim by moving their tails up and down. When a whale leaps out of the water, sometimes twirling around, it is called breaching. This action may be done purely for play, or may be used to loosen skin parasites and other irritations the whale might have. Breaching is also believed to be a means of communication with other whales and is usually done in sets of between four and six. Fluking is when a whale raises its tail out of the water as it begins a dive. This is an activity in which the animal sticks its tail out of the water, swings it around and then slaps it onto the water’s surface. This produces a loud sound which is believed to be a means of communication between whales. When whales blow water out of the blowholes located near the top of the head it is known as spouting. Southern Right Whales have two blowholes which act as nostrils. When they blow water out of their blowholes a distinctive V-shaped cloud of vapour is produced largely by condensation when warm breath comes into contact with cooler air. An activity in which the whale pokes its head out of the water, possibly to take a look around. You can spot whales by looking for white patches in the ocean where the waves break on their bodies. When they breach they also cause a huge white splash. Whales are along our coastline during the months of May to December, so make sure that you come to see them at the right time of year! Be patient – Seeing your first whale is an experience you will never forget. Whales can be seen from land, but there are also many boat-based tours available. If you get seasick, take medication or get a patch – it helps! Beluga whales don’t chew their food. They swallow it whole. In zoos, Beluga whales eat about 2.5% to 3% of their body weight per day.Male Beluga whales weigh about 3,307 pounds and females about 2,998 pounds. They reach their full size at about 10 years old. The head of the Southern Right is large and covered with wart-like bumps called callosities. These differ in size and position and are often used to identify individuals. Orcas have good eyesight both underwater and above the surface. A thick layer of fat, or blubber, helps an orca stay warm even in icy waters. The largest male orca ever recorded was 32 feet (10 meters) long. It weighed 22,000 pounds (10,000 kilograms). Male orcas average 19 to 22 feet (6 to 7 meters) in length; females average 16 to 19 feet (5 to 6 meters) long. Male orcas weigh, on average, 8,000 to 12,000 pounds (3,600 to 5,500 kilograms). Killer whales are nicknamed “wolves of the sea” as they hunt in packs. The humpback whale has the longest flippers of any mammal, up to one third of the body length.